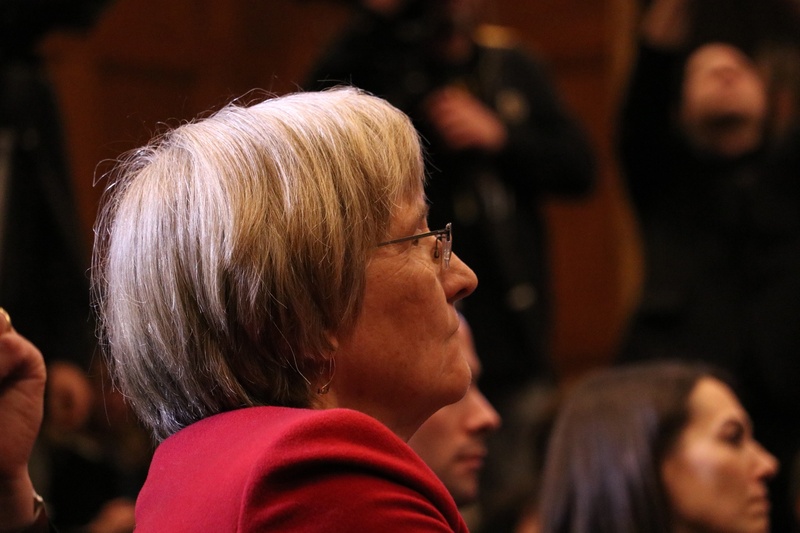 Harvard will collectively bargain with its newly formed graduate student union, University President Drew G. Faust said in an interview Tuesday. University President Drew G. Faust said Harvard plans to bargain with its new student union in an interview Tuesday. UPDATED: May 1, 2018, at 4:31 p.m. The University’s move to bargain marks the final and full validation of the organizing effort, ensuring Harvard will see a student union for the first time in its history. The decision comes roughly a week after eligible students voted to unionize in the University’s second-ever election on the issue; the final tally saw 1,931 ballots cast in favor of unionization and 1,523 against. The move to recognize Harvard’s fledgling union breaks with recent precedent set by several other schools. In the past few months, multiple peer universities—including Columbia, Yale, University of Chicago, and Boston College—refused to open negotiations after student assistants on their campuses similarly voted to unionize. University Provost Alan M. Garber ’76 announced Harvard plans to bargain with the union in an email sent to University affiliates Tuesday afternoon. “In light of the outcome of the vote and the existing NLRB precedent, Harvard is prepared to begin good-faith negotiations, guided by our fundamental commitments as an academic institution,” he wrote. In an emailed statement, HGSU-UAW organizer Andrew B. Donnelly wrote that the union looks forward to future negotiations with the University. Across Harvard’s second unionization election, held April 18 and 19, just under 56 percent of students who cast ballots voted to allow Harvard Graduate Students Union-United Automobile Workers to begin collectively bargaining with the University on their behalf. Around 5,000 graduate and undergraduate teaching and research assistants were eligible to vote, the same number of students the union now represents. In total, 3,454 eligible students cast ballots. National Labor Relations Board officials certified the election results Monday. The seven-day deadline to file objections regarding the conduct of the election passed last week without challenges from the University or HGSU-UAW, prompting the NLRB to officially confirm the ballot count. Union organizers called the election process “smooth” in interviews last week, commending University officials’ handling of logistics. “We will be very adamant about differentiating between matters that are appropriate for academic decision making from matters that are concerns of a labor or employment situation,” Faust said. Faust last offered public comment on unionization in Sept. 2015, calling the unionization effort “not appropriate.” At the time, she said she disapproved of the effort to unionize, arguing a union would change the nature of the “mentoring relationship” between graduate students and faculty. Faust said on Tuesday she maintains her previous position. Harvard’s decision to bargain with HGSU-UAW comes amid multiple challenges to the legal precedent legitimizing graduate student unionization. The NLRB—which previously affirmed and overturned decisions on graduate student unionization—set the most recent precedent in 2016 when it ruled to allow a unionization election at Columbia to proceed. Labor experts widely believe the current Republican-led NLRB will overturn graduate students’ right to unionize if the board hears a viable case on the matter. Several of the universities that have declined to bargain with their student unions appeared to bank on this prediction, appealing their case to the labor board in Washington, D.C. Campus unions have staged demonstrations and protests in response. A handful of unions have withdrawn representation petitions altogether to prevent their universities’ cases from reaching the NLRB. Administrators at Columbia recently appealed their case to the Second Circuit Court, arguing student unions compromise the academic environment on campus. Student organizers at Columbia concluded a weeklong strike Monday in response to the university’s refusal to bargain and are circulating a petition to garner support for another strike this fall. Immediately after the election, HGSU-UAW began soliciting nominations for its bargaining committee, the main body which will negotiate on behalf of students. The window for nominations closes May 1 at midnight.